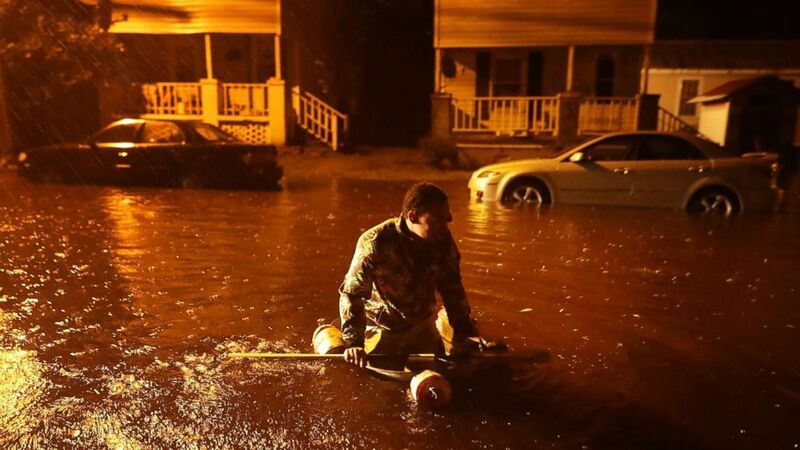 North Carolina officials are working to rescue residents who were stranded. As Hurricane Florence hammers North Carolina's coastline with relentless rain and wind, first responders are scrambling to rescue residents who didn't heed evacuation orders and are now stranded in their homes, cars and even on rooftops amid rising floodwaters. About 300 residents in the coastal town of New Bern had been rescued by early Saturday morning and were taken to shelters after the dangerous Category 1 hurricane moved ashore early Friday, according to New Bern's government. Another 100 were still awaiting rescue overnight Friday into Saturday with "three rescue teams who are working around the clock to get into communities to retrieve people." "It's very unsafe. I immediately spoke with the police chief and we decided we need a 24-hour curfew," Mayor Dana Outlaw said in an interview Friday on "Good Morning America." "It's just a very, very dangerous situation right now for New Bern," he added. (Chip Somodevilla/Getty Images) Michael Nelson floats in a boat made from a metal tub and fishing floats after the Neuse River went over its banks and flooded his street during Hurricane Florence Sept. 13, 2018 in New Bern, N.C.
"I think we kind of let our guards down," Zaytoun told "GMA" in a telephone interview Friday morning. "In hindsight, yes, I would have probably gotten out of here." Zaytoun's home is located on higher ground and he installed a generator and stocked up on supplies in preparation. But he's currently surrounded by floodwater. "It's like a bomb has gone off here," he said. "Everything around us is underwater." "I think we're not out of the woods by a long shot," Zaytoun said. 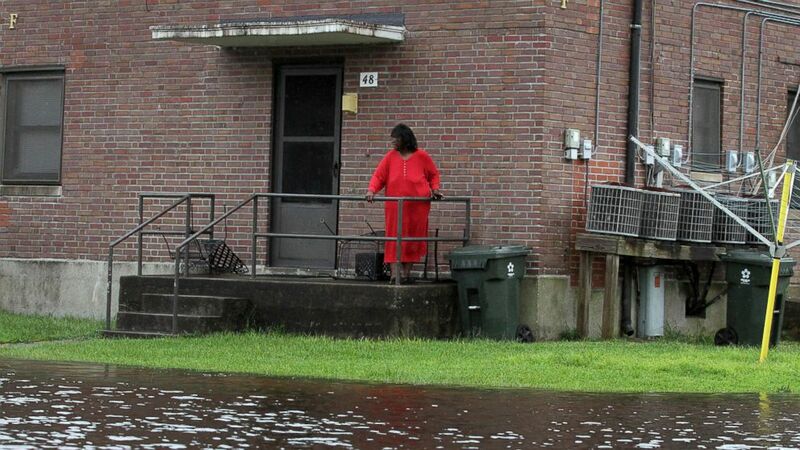 (Gray Whitley/Sun Journal via AP) Residents at Trent Court Apartments wait out the weather as rising water gets closer to their doors in New Bern, N.C., Sept. 13, 2018. "Even if the storm were to stop right now, it would still take almost a week for all that water to drain out," Schreiber told "GMA" in a telephone interview Friday morning. "We knew it would be bad," he said of the storm. "So it's a choice of ... do you leave and not be able to get back or if you try to come back, you get halfway and you're stuck again?" (Gray Whitley/Sun Journal via AP) Union Point Park is flooded with rising water from the Neuse and Trent Rivers in New Bern, N.C., Sept. 13, 2018. North Carolina Gov. Roy Cooper has declared a state of emergency due to Florence, which made landfall with 90 mph winds near Wrightsville Beach at 7:15 a.m. local time Friday. The storm is moving slowly -- just 5 mph -- in a southwest direction and is expected to reach South Carolina by early Saturday morning, according to the latest forecast from the National Weather Service. The center of the storm was about 15 miles west-northwest of Myrtle Beach, South Carolina, as of 11 p.m.
"Florence is an uninvited brute who doesn't want to leave," Cooper told "GMA" in an interview Friday morning. "This is a slow-moving storm." 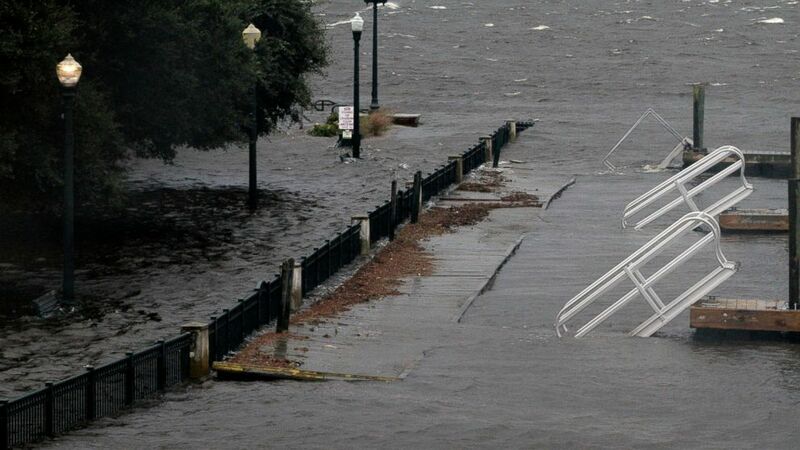 Four deaths in North Carolina have been blamed on the storm. A mother and her baby were killed when a tree fell on their house in the port city of Wilmington. The father was transported to a local hospital with injuries, police said. Gov. Cooper said one person died in Lenoir County while plugging in a generator. 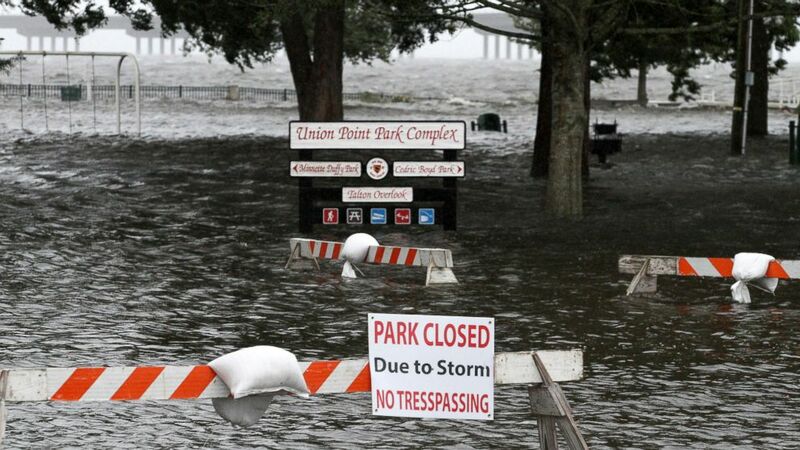 (Gray Whitley/Sun Journal via AP) Union Point Park is flooded with rising water from the Neuse and Trent Rivers in New Bern, N.C. Sept. 13, 2018. "As soon as it is safe, first responders will make sure they go and rescue people who need to be saved from this storm," Cooper said on "GMA." He urged trapped residents to "hunker down," "stay in your homes," "get to higher floors" and wait for first responders. "Help will come to you if you can let us know where you are," he said, adding that "we would have rather everybody leave so that we wouldn’t be faced with these situations." 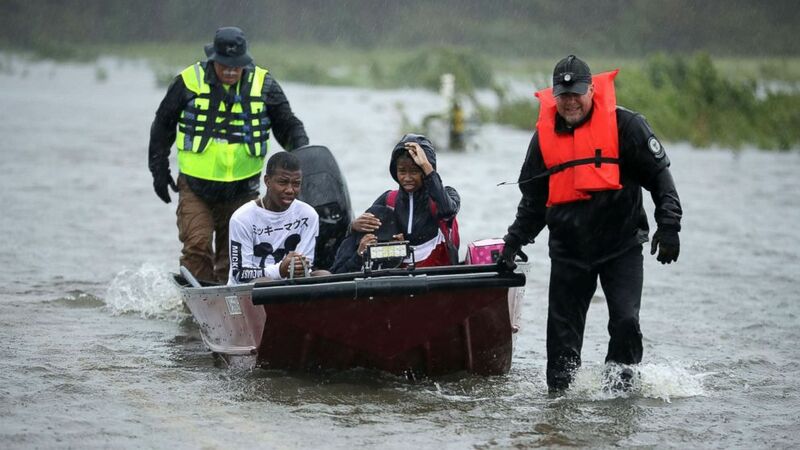 (Chip Somodevilla/Getty Images) Volunteers from the Civilian Crisis Response Team help rescue three children from their flooded home, Sept. 14, 2018, in James City, N.C.
"I would say certain areas of New Bern are very desperate," Parker told ABC News in an interview Friday. "There are people that can be trapped in water, in vehicles, on roofs. That's just the situation for anyone." In some cases, the volunteers had to use air mattresses to float people to safety because the storm's gusty winds were toppling rescue boats. "A lot of people did not get out, tried to drive out and a lot got stuck in conditions on the roads, so a lot of people we were rescuing from the tops of their vehicles," Todd Terrell, founder of the Baton Rouge-based United Cajun Navy, said on "GMA." (Chip Somodevilla/Getty Images) Rescue workers from Township No. 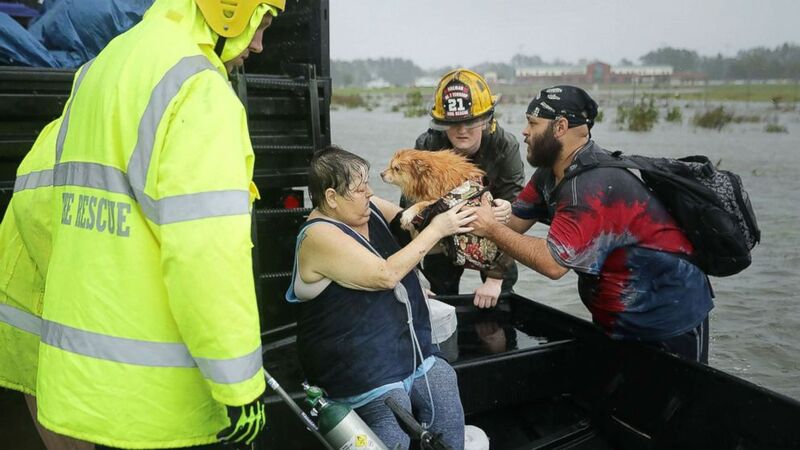 7 Fire Department and volunteers from the Civilian Crisis Response Team help rescue a woman and her dog from their flooded home during Hurricane Florence, Sept. 14, 2018, in James City, N.C.
Gov. Cooper told reporters at a press conference Friday morning that utility crews "from all over the country" are standing by to restore power as soon as it's safe to do so. Cooper said many residents at risk of flooding were moved to higher ground prior to the storm's arrival, and officials will continue to share critical flood mapping information to pinpoint where the next evacuations may be needed. "We are a hardy bunch, we are resilient, we can get through this," he told "GMA." "We’re going to work hard to make sure people have the resources they need to get through the storm." ABC News' Matt Foster, Joshua Hoyos, Dominick Proto and Stephanie Wash contributed to this report.